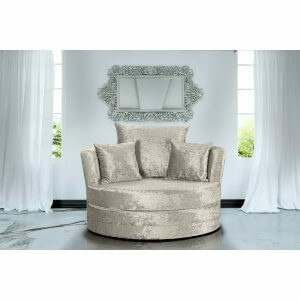 Snuggle / cuddle chair in silver crushed velvet • Swivel mechanism to rotate • Soft foam padded seating and scatter cushions. • Crushed velvet style polyester fabric which is hard wearing. • Glitz and glamour. • Hard wood frame • Full UK Fire Rated. 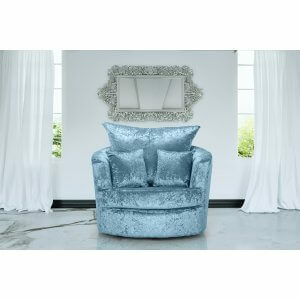 Blue crushed velvet snuggle / cuddle chair • Swivel mechanism to rotate • Soft foam padded seating and scatter cushions. • Crushed velvet style polyester fabric which is hard wearing. • Glitz and glamour. • Hard wood frame • Full UK Fire Rated. Cream crushed velvet snuggle / cuddle chair • Swivel mechanism to rotate • Soft foam padded seating and scatter cushions. • Crushed velvet style polyester fabric which is hard wearing. • Glitz and glamour. • Hard wood frame • Full UK Fire Rated. 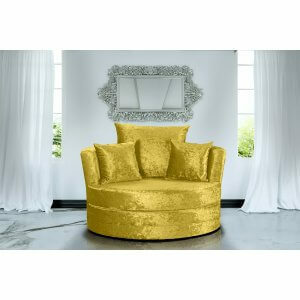 Gold crushed velvet snuggle / cuddle chair • Swivel mechanism to rotate • Soft foam padded seating and scatter cushions. • Crushed velvet style polyester fabric which is hard wearing. • Glitz and glamour. • Hard wood frame • Full UK Fire Rated. Lavender crushed velvet snuggle / cuddle chair • Swivel mechanism to rotate • Soft foam padded seating and scatter cushions. • Crushed velvet style polyester fabric which is hard wearing. • Glitz and glamour. • Hard wood frame • Full UK Fire Rated. Mulberry crushed velvet snuggle / cuddle chair • Swivel mechanism to rotate • Soft foam padded seating and scatter cushions. • Crushed velvet style polyester fabric which is hard wearing. • Glitz and glamour. • Hard wood frame • Full UK Fire Rated. Mink crushed velvet snuggle / cuddle chair • Swivel mechanism to rotate • Soft foam padded seating and scatter cushions. • Crushed velvet style polyester fabric which is hard wearing. • Glitz and glamour. • Hard wood frame • Full UK Fire Rated. Blue crushed velvet snuggle / cuddle chair • Soft foam padded seating and scatter cushions. • Crushed velvet style polyester fabric which is hard wearing. • Glitz and glamour. • Hard wood frame • Full UK Fire Rated. Cream crushed velvet snuggle / cuddle chair • Soft foam padded seating and scatter cushions. • Crushed velvet style polyester fabric which is hard wearing. • Glitz and glamour. • Hard wood frame • Full UK Fire Rated. Lavender crushed velvet snuggle / cuddle chair • Soft foam padded seating and scatter cushions. • Crushed velvet style polyester fabric which is hard wearing. • Glitz and glamour. • Hard wood frame • Full UK Fire Rated. Mink crushed velvet snuggle / cuddle chair • Soft foam padded seating and scatter cushions. • Crushed velvet style polyester fabric which is hard wearing. • Glitz and glamour. • Hard wood frame • Full UK Fire Rated. 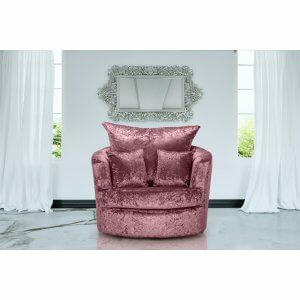 Mulberry crushed velvet snuggle / cuddle chair • Soft foam padded seating and scatter cushions. • Crushed velvet style polyester fabric which is hard wearing. • Glitz and glamour. • Hard wood frame • Full UK Fire Rated. Silver crushed velvet snuggle / cuddle chair • Soft foam padded seating and scatter cushions. • Crushed velvet style polyester fabric which is hard wearing. • Glitz and glamour. • Hard wood frame • Full UK Fire Rated.